This review is of the cut shown at the BFI London Film Festival in October 2016 – the UK release date is currently listed for January 6th 2017. Patrick Ness’ award-winning novel A Monster Calls notably has a co-credit. The concept originated from writer Siobhan Dowd, who according to Ness “had the characters, a premise, and a beginning. What she didn’t have, unfortunately, was time.” This was in reference to the very sad fact that she passed away in 2007, at the age of 47 from advanced breast cancer, and it was left to Ness to complete and publish what would end up being her final story after a prolific writing career of her own. Since then, the novel has become one of the most popular books from both Ness and Dowd’s bibliography, and gained a legion of fans who were moved by their combined creative forces to deliver a heartfelt and painfully mature perspective of growing up around a devastating situation. The film version, adapted by Ness and directed by The Impossible’s J.A. Bayona, manages to maintain the emotional power of Dowd’s original idea, and though I have some issues with it as a complete film, it still packs enough of a punch to make you feel something for the characters on-screen and what they’re going through. If you’re not familiar with the story, it focuses on a 13-year-old boy named Conor (newcomer Lewis MacDougall), who is going through some extremely rough patches. Not only is he being severely bullied at school, but his mother (Felicity Jones) is suffering from a terminal illness, and is increasingly fading away with each passing day, a fact that Conor is struggling to accept. This is where the more fantastical element comes into play, as a giant humanoid tree monster (voiced by Liam Neeson) suddenly pays a visit to Conor, and instead of devouring him the monster says that he will return each night at 12:07 and tell him three stories, and after each of them has been told Conor must then tell the monster a story. That makes up the bulk of the narrative, mixed in with several scenes of Conor facing difficulties in his reality, including living with his stern grandmother (Sigourney Weaver, desperately trying to mask her American accent with a thinly-veiled English one), and dealing with his absent father (Toby Kebbell), who has started a new family out in LA. Ness adapts his and Dowd’s story as competently as you would expect, but it’s the visual prowess brought to the table by Bayona and cinematographer Óscar Faura that makes it stand out. A watercolour opening credits sequence foreshadows some of the inspired visuals we get to see later on, particularly when we get to see the monster’s stories being told via animated segments. Comparisons will undoubtedly be made to the similar animated story that was told in Harry Potter and the Deathly Hallows: Part 1, but here Bayona gets to use the animation department a little more frequently, and each one is stunning in how they not only look absolutely beautiful, but also how they seamlessly fit into the larger narrative, which – given there is a giant tree monster as a prominent character – is probably hard to fathom for some. When it does go back to that realm of reality, it is still striking but in a completely different way; Faura captures the murkiness and overcast atmosphere of the English countryside village where it takes place, and Bayona uses that to enhance the audience’s emotional attachment to the tragic circumstances young Conor is experiencing. It’s a storytelling device known as “pathetic fallacy”, where forces of nature, i.e. the weather, are used to reflect the emotions being experienced by characters, and both Ness and Bayona combine their interpretations of the device to make something that is consistently beautiful to look at, even at its cloudiest. That said, it isn’t a perfect film, at least from my perspective. Much like a lot of the adaptations I end up seeing, A Monster Calls is still in my “to read” pile, and while I have no doubt that it’s a captivating read there were certain parts of the story which, to me, just didn’t seem to gel as well as it could. Though it is a very well-acted film, some of the talented cast are stuck with playing characters that don’t always seem credible. Weaver, despite her clear efforts, can’t help but feel incredibly miscast here, not least because of her on-and-off accent (was Celia Imrie not available, or Penelope Wilton? Seriously, there are hundreds of suitable actresses for the part, so why go for someone who clearly isn’t the right fit? ), and it made her cold-hearted character a little trickier to sympathise with in her more humanised moments. There are also parts of the film, particularly as it starts to wrap up, which hit me over the head a little too hard whenever it tried to be really emotional, and while there is definitely a lot of emotion that was felt in this movie there were parts which just seemed to be a little too manipulative for my tastes. I can sense you thinking right now that I don’t have a heart because of this, but that’s just how it came across to me. Regardless, I would still recommend this as a strong film to watch, and if you are the sort of person that gets properly teary-eyed at this type of film, then there’s nothing wrong with that and you should enjoy this just fine. For me, A Monster Calls might not be as powerful as everyone makes it out to be, but when it comes to representing a story that Siobhan Dowd held so clearly to her heart before her untimely passing, I would say that it deserves a monstrous amount of praise. 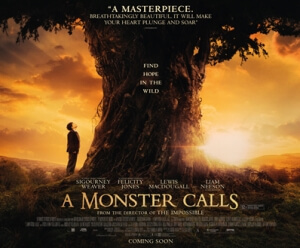 A Monster Calls hits most of the right emotional notes that originated from Patrick Ness and the late Siobhan Dowd’s acclaimed novel, although there are parts which were perhaps a bit too manipulative for its own good.